The popular Friends Photo Auction is back! More than 100 prints will be auctioned on Wednesday, Dec. 12, at The Highline Loft in Manhattan. If you cannot attend, you can bid on the prints now via Artsy atwww.Artsy.net/fwab. 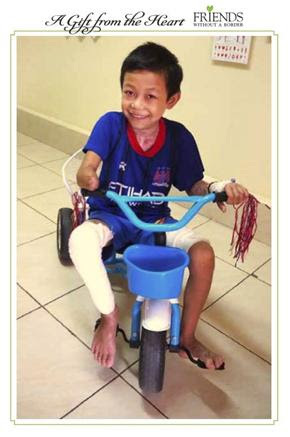 Airnoy Khamxaiy was born prematurely at home with no health care professional present. His family cut his umbilical cord with bamboo. 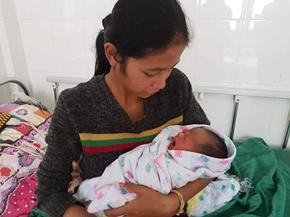 The neonatal staff at LFHC determined that their tiny patient showed signs of infection, but was otherwise stable. They administered intravenous antibiotics and immunized him to prevent neonatal tetanus from developing as a result of his umbilical cord being cut with bamboo. 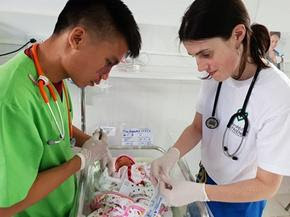 Neonatal tetanus is particularly common in rural areas where most deliveries occur at home without adequate sterile procedures, according to the World Health Organization. Most infants who get the disease do not survive. Kate Corrigan, whose nursing career includes service in the U.S., Haiti and Ecuador, recently started working at LFHC as the hospital’s Director of Nursing. Kate focused on pediatric intensive care while working at several children’s hospitals in the U.S., including eight years at the Children’s National Medical Center in Washington, D.C.
A native of Seattle, she earned her degree in nursing in Ohio at the Franciscan University of Steubenville. After graduation, she spent a year in Ecuador, helping the Catholic Medical Mission Board develop a small, same-day surgical center in Quito. Kate also holds a masters degree in global health from The George Washington University. In 2012, she served as chief nursing officer at a trauma hospital in Port-au-Prince, Haiti, and four years later supported the disaster relief efforts in that Caribbean nation in the aftermath of Hurricane Matthew. According to the most recent data available, LFHC’s doctors and nurses treated 2,200 children as outpatients in October — setting a new caseload record for a single month in that department. 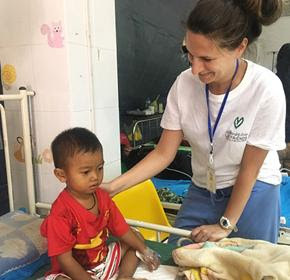 A native Australian, Lisa brings a wealth of knowledge and international experience to the position, having worked as a pediatric nurse in more than 15 countries. She has worked twice as a nursing volunteer at LFHC. Renovations have been completed and the Friends Gallery is now open for business! Located in downtown Luang Prabang, the boutique is where one finds the best collection of treasures from Luang Prabang and Siem Reap — the locations of the two hospitals built by Friends Without A Border. 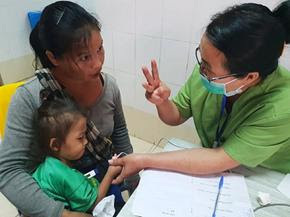 Sales help finance the free medical treatment provide by Lao Friends Hospital for Children. 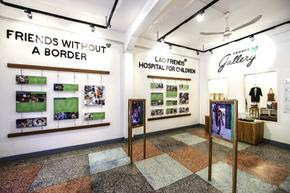 The Board of Directors and staff of Friends Without A Border and Lao Friends Hospital for Children would like to wish everyone a healthy, happy holiday season. We would also like to extend our heartfelt thanks for your support during the year. As readers of our monthly newsletter, you know how much the hospital has grown during 2018. And you’ve no doubt read about some of the children whose lives have been saved thanks to your generosity. In this holiday season of giving, we ask that you consider making a gift that makes a difference, a gift that transverses borders, a gift that saves lives. Donations may be made here on our website. The Friends Holiday Cards may be ordered here.